Microservices vs SOA: What's the Difference? Are microservices the new SOA? Do people still talk about SOA? Let's investigate the differences between monoliths and these two newer architectures. In the previous blog, "What Is Microservices," you got to know that SOA and microservices, which have distributed architectures, offer significant advantages over monolithic architecture. In this blog, I will explain layered-based architectures and tell you the difference between microservices and SOA architecture. In layman's terms, a monolith is similar to a big container wherein all the software components of an application are assembled together and tightly packaged. Service-oriented architecture is essentially a collection of services. These services communicate with each other. The communication can involve either simple data passing or two or more services coordinating some activity. Some means of connecting services to each other is needed. Microservices, aka microservice architecture, is an architectural style that structures an application as a collection of small autonomous services modeled around a business domain. You can also watch the below video, where our microservice architecture expert has explained the differences between microservices architecture and SOA. 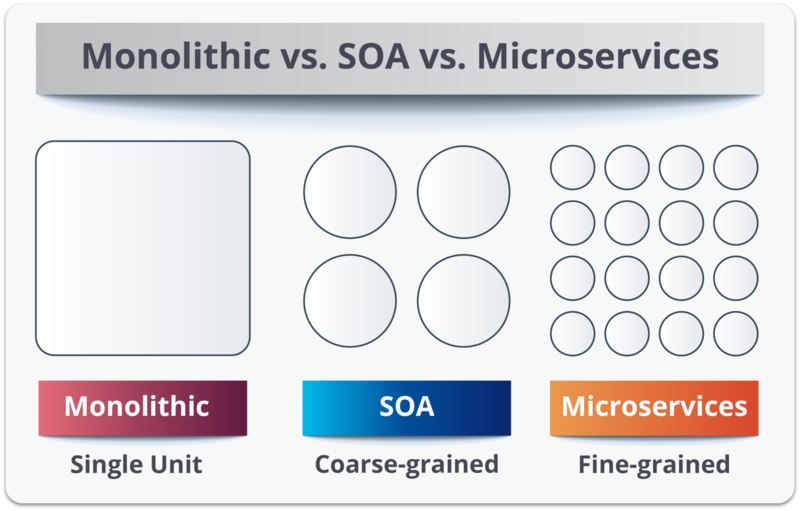 When comparing microservices to SOA, they both rely on services as the main component, but they vary greatly in terms of service characteristics. Coarse-grained services that define core business operations. Represented through XML, Business Process Execution Language (BPEL), and others. Implement the functionality defined by business services. Mainly rely on application services and infrastructure services to fulfill business requests. Fine-grained services that are confined to a specific application context. A dedicated user interface can directly invoke the services. Implement non-functional tasks such as authentication, auditing, security, and logging. Can be invoked from either application services or enterprise services. Microservices have limited service taxonomy. They consist of two service types, as depicted below. Accessing of services is done externally and these services are not shared with other services. As in SOA, infrastructure services implement tasks such as auditing, security, and logging. In this, the services are not unveiled to the outside world. 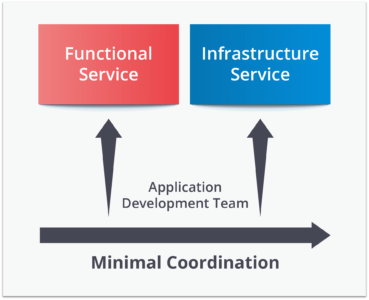 Service Granularity: Service components within a microservices architecture are generally single-purpose services that do one thing really, really well. With SOA, service components can range in size anywhere from small application services to very large enterprise services. In fact, it is common to have a service component within SOA represented by a large product or even a subsystem. Component Sharing: Component sharing is one of the core tenets of SOA. As a matter of fact, component sharing is what enterprise services are all about. SOA enhances component sharing, whereas MSA tries to minimize on sharing through “bounded context.” A bounded context refers to the coupling of a component and its data as a single unit with minimal dependencies. As SOA relies on multiple services to fulfill a business request, systems built on SOA are likely to be slower than MSA. 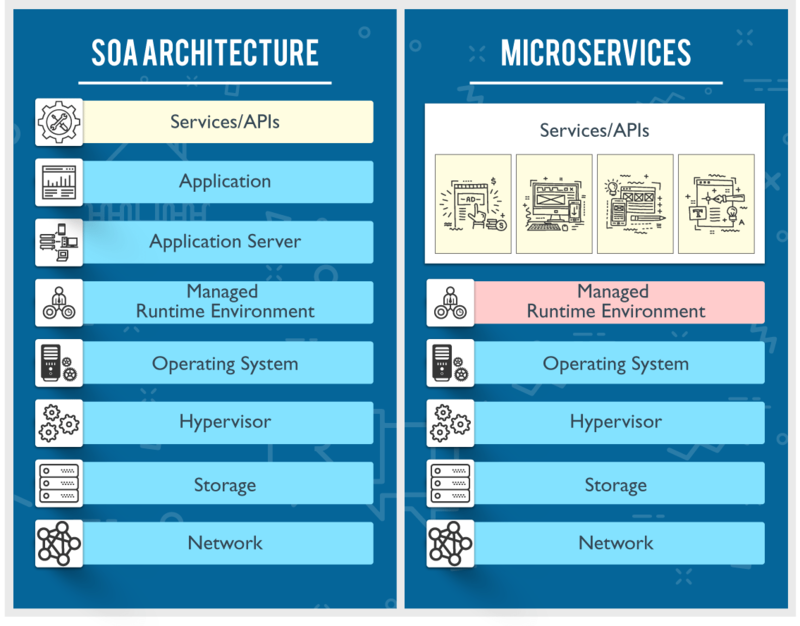 Middleware vs API layer: The microservices architecture pattern typically has what is known as an API layer, whereas SOA has a messaging middleware component. The messaging middleware in SOA offers a host of additional capabilities not found in MSA, including mediation and routing, message enhancement, message, and protocol transformation. MSA has an API layer between services and service consumers. Heterogeneous interoperability: SOA promotes the propagation of multiple heterogeneous protocols through its messaging middleware component. MSA attempts to simplify the architecture pattern by reducing the number of choices for integration. If you would like to integrate several systems using different protocols in a heterogeneous environment, you need to consider SOA. If all your services could be exposed and accessed through the same remote access protocol, then MSA is a better option. In the end, I will say it is not that simple to tell which architecture is better than another. It mainly depends on the purpose of the application you are building. SOA is better suited for large and complex business application environments that require integration with many heterogeneous applications; smaller applications are not a good fit for SOA as they don’t need a messaging middleware component. Microservices, on the other hand, are better suited for smaller and well-partitioned, web-based systems in which microservices give you much greater control as a developer. The conclusion is that since they both have different architecture characteristics, it mainly depends on the purpose of the application you are building.